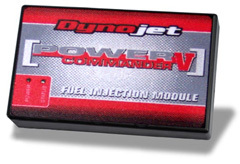 The Online Shop for the Dynojet Power Commander. The Power Commander V 20-003 is supplied with a base map stored for the Suzuki DL 650 V-Strom 2007-2011 in the microprocessor. This (base map) is typically a map that has been developed to provide an improvement for most combinations matching the map description (i.e. stock bike or performance exhaust and air filter). In general we have found that a typical stock bike has areas in the fuel curve that are far from optimal for drive-ability and performance. We could say that they are typically 70% optimized in stock condition and 60% - 65% with minor performance modifications. After installation of the Power Commander with the base map, we would expect to see 85% - 95% optimization. The Power Commander Software and different maps for the Suzuki DL 650 V-Strom you get from the Manufacturer here to Download. Wich map for your bike is availible you see here. Not Street Legal, for Racing Vehicles only! » More information about frequently asked questions, please see our Power Commander-FAQ. « back to overview "Suzuki Power Commander"